Emir Kobilić, who performs under the name Salvatore Genacci. In a few of its occasional flashbacks, the TV show The Good Place has had fun at the expense of EDM DJs, depicting a world of preening, empty spectacle and performances that consist of little more than a dope in a costume pressing a space bar and pantsing around. It's not entirely fair, but it's funny. 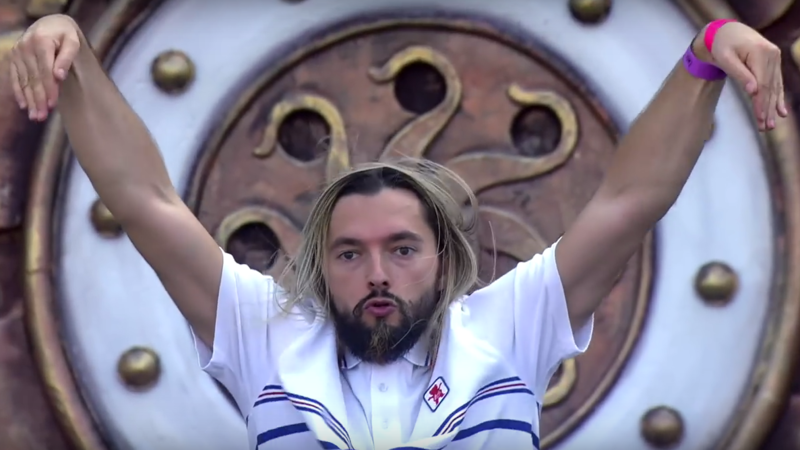 It's also, as parodies go, positively muted compared to the antics of Bosnian-born Swedish DJ Salvatore Ganacci at last weekend's Tomorrowland 2018 festival in Belgium. He twerks! He does a handstand! He yelps, over a generic and disjointed mishmash of electronic music at strange and unhelpful times! He... I mean, watch for yourself. "Sacha Baron Cohen channeling the spirit of Andy Kaufman to make fun of EDM concerts" about describes it, but at the same time, this is a performance with commitment. Say what you will about Salvatore Ganacci: He is not phoning his performance in.